Doubleday of Canada. PAPERBACK. 0385659288 New Condition. . New. Doubleday of Canada. PAPERBACK. 0385659288 Like New Condition. . Fine. Toronto, Ont: McClelland & Stewart, 1976. Book. Very Good. Hardcover. Signed by Author(s). Canadian First. 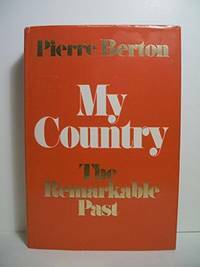 Signed by Pierre Berton on the title page with no inscription; edge wear to boards and dust jacket; otherwise a solid, clean copy with no marking or underlining; collectible condition; illustrated with black and white photographs; dust jacket is protected by a Brodart sleeve..
Doubleday of Canada, 2002. Book. Fine. Soft cover. Clean & newlooking. With illustrations & maps. .
Toronto: McClelland and Stewart [0-7710-1393-0] 1976, 1st edition. (Hardcover) 320pp. Very good in very good dust jacket. Illustrated endpapers, photographs, illustrations, maps, index. The dust jacket has a few edge-tears and is lightly faded on the spine. Book about Billy Bishop, Charles Blondin, Charles Paschal Telesphor Chiniquy, Simon Peter Gun-An-Noot, Samuel Hearne, Robert Service & Joshua Slocum. (History--Canada, Fur Trade, Gold Rush, Hudson's Bay Company, Indians of N.A., Temperance Movement). Toronto: McClelland Stewart, 1976. First Edition . Hardcover. Good/Good. 8vo - over 7¾" - 9¾" tall. Good orange cloth. Scratched, scuffed rear panel. Illustrated endpapers. Good red price clipped DJ. Some wear and tear, fading, chipping to DJ. (1976), 8vo, , 9-320pp. SPADONI & DONNELLY 2713, Aubin & Cote (1976-1980), Hoy 4398, "The book contains something for everyone from the story of the genocide of the Beothuk Indians in Newfoundland to the weird and almost unbelievable saga of The Brother, XII, and his mystic cult on Vancouver Island." Toronto: McClelland And Stewart. Very Good in Good dust jacket. 1976. Hardcover. DJ has small tears. .
Toronto, Ontario: McClelland & Stewart, 1976. Book. Very Good. Hardcover. Signed by Author(s). Canadian First. Signed and dated Nov '76 on the title page by Pierre Berton with no inscription; some edge wear to boards and dust jacket; some fading to spine; otherwise a solid, clean copy with no marking or underlining; collectible condition; illustrated with black and white photographs, drawings and maps..
McClellan and Stewart Ltd.. Hardcover. 150941 My Country and The Wild Frontier in two volumes in slipcover. . Good. 1977. Toronto: McClelland Stewart, 1976. First Edition . Hardcover. Very Good/Very Good. 8vo - over 7¾" - 9¾" tall. Very good orange cloth. Illustrated endpapers. Very good red DJ. Some wear and tear, fading, chipping to DJ. (1976), 8vo, , 9-320pp. SPADONI & DONNELLY 2713, Aubin & Cote (1976-1980), Hoy 4398, Sir John Franklin biography. "The book contains something for everyone from the story of the genocide of the Beothuk Indians in Newfoundland to the weird and almost unbelievable saga of The Brother, XII, and his mystic cult on Vancouver Island." Doubleday of Canada, 2002. Paperback. Good. Bantam Doubleday Dell, 1979. Paperback. Good. Disclaimer:A copy that has been read, but remains in clean condition. All pages are intact, and the cover is intact. The spine may show signs of wear. Pages can include limited notes and highlighting, and the copy can include previous owner inscriptions. At ThriftBooks, our motto is: Read More, Spend Less.Dust jacket quality is not guaranteed. MCCLELLAND & STEWART, 1986-01-01. Paperback. Good. Toronto, ON, Canada: McClelland & Stewart, 1986. pp.320 with index clean tight unread copy covers show slight rubbing to edges with a small nick middle front outer edge. Soft Cover. Near Fine. 8vo - over 7¾" - 9¾" Tall. Doubleday of Canada. Used - Good. Former Library book. Shows some signs of wear, and may have some markings on the inside. Toronto: McClelland and Stewart, 1891. Fifth Printing. Hardcover. Very Good+ in Very Good+ DJ. 6 x 9, 320 pgs, index, b&w photos, decorated endsheets. The author brings the Canadian past alive with true stories of mystery and romance, tragedy and heroism, from the piracy of Bill Johnston, scourge of the St. Lawrence, to the weird saga of Brother XII and his mystic cult on Vancouver Island. Toronto, Ontario: Toronto, ON: McClelland and Stewart ( M&S ), 1976, 1st edition, First Printing, 1976. -----------hardcover, a Very Good+ copy with some light edge wear, in a chipped and torn Good price clipped dustjacket, signed by Berton without inscription, 320 pages, b&w photos, contents include: The Great Cross canada Hike; The Pirate of the St Lawrence; Sailing Alone Around the World; Samuel Hearne's Epic Trek; Billy Bishop, the Lone hawk; The Strange case of the Brother, XII; The Last of the Red Indians; The Zeal of Charles Chiniquy; The Franklin Mystery; Bloody Sunday in vancouver; Ned Hanlon and the Golden Age of Sculling; The First Commando Raid; The Mysterious safari of Charles Bedaux; The man Who Invented Dan McGrew; The Search for Gun-an-Noot; Blondin Walks Niagara Gorge; The Overlanders; The Ordeal of Francois Xavier Prieur, any image directly beside this listing is the actual book and not a generic photo. Signed. First Edition. Hard Cover. Very Good+ ( see Description )/Good (see description). Illus. by Text Cover. Toronto, ON, Canada: McClelland & Stewart, 1986. 320pp including index Maps Illustrations Photos Collection of true tales from Canada's past . Glossy Softcover. As New. Toronto: McClelland & Stewart, 1976. Hardcover with price clipped dust jacket, 320 pages including maps and black-and-white illustrations;--- signed by Berton on the title page and dated by him "June '78", with a ten-word personalized inscription by him;---book has tiny traces of shelf and reading wear, light dust speckling to top edge, but very gently read, otherwise very clean and unmarked throughout, pages fresh and white; DJ rubbed along edges, many chips and tiny tears.. Signed by Author. First Edition. Hard Cover. Very Good ++/Good. Toronto: Mcclelland & Stewart, 1977,. Hard bound, 3rd printing, illustrated, 320pp inc. index, remainder marks to edge else Very good in moderately rubbed Very good dust jacket. Bantam Doubleday Dell. Used - Good. Former Library book. Shows some signs of wear, and may have some markings on the inside. McClelland Stewart, 1976. A fine red oversize hardcover in a very good dust jacket. Copyright 1976, 1st edition..
M & S. Paperback. 0771013922 . Fair. 1976. M & S, 1986. Paperback. Acceptable. Disclaimer:A readable copy. All pages are intact, and the cover is intact. Pages can include considerable notes-in pen or highlighter-but the notes cannot obscure the text. At ThriftBooks, our motto is: Read More, Spend Less.Dust jacket quality is not guaranteed. Toronto: McClelland Stewart, 1980. Slight edgewear, clean interior. Light edgewear to dust jacket, now in a protective mylar cover. 315 pages, plus index, no stamps or writing. Decorated endpapers. . Fourth Printing. Hard Cover. Very Good/Good++ Dust Jacket. Illus. by Photo Illustrated. 9 3/4" X 6 3/4". Anchor, 2002. Trade Paperback. Very Good. M & S. Used - Good. Good condition. McClelland Stewart, 1976. Hardcover. Good. Hardcover. Sound & good copy, light to moderate edgewear, bumping to boards, clipped at second inside page. Jacket has light to moderate rubbing/edgewear. Not price clipped. Toronto: Seal, 1979. Canada's remarkable past. Light creases to the spine.. Paperback. Good+. Doubleday Canada, 2002. Paperback. Good. Disclaimer:A copy that has been read, but remains in clean condition. All pages are intact, and the cover is intact. The spine may show signs of wear. Pages can include limited notes and highlighting, and the copy can include previous owner inscriptions. At ThriftBooks, our motto is: Read More, Spend Less.Dust jacket quality is not guaranteed. Mcclelland & Stewart, 1976. Hardcover. Good.